Before diving into this project let’s break it down. Brie is a type of soft cheese and en croute simply means wrapped in pastry. The phonetic pronunciation is bree on kroot. A brie en croute consists of a round of brie cheese, topped with jam, and then wrapped in puff pastry. Place all of these components in the oven. The brie cheese gets soft and melty and the pastry gets brown and crispy… Yum! Making a brie en croute is such a fun way to personalize your food for a party. 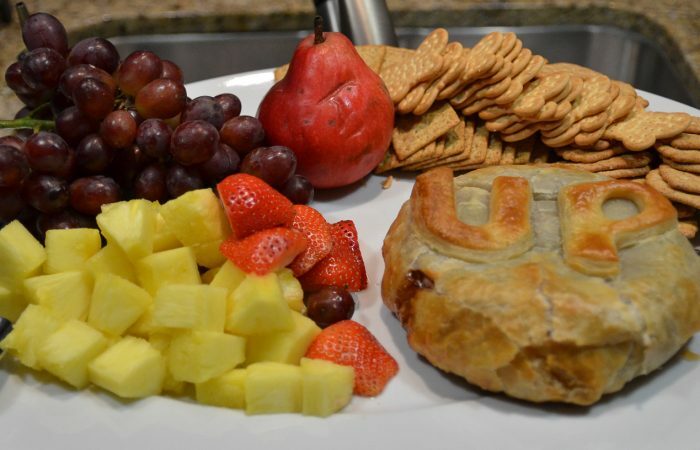 Since we had an UP party, we wanted to make this Brie En Croute with the UP letters. The possibilities for letters and symbols are endless!